DEAN JONES: David, I had wanted to start answering some of the questions that you had sent me. The first one, "How did you become involved with Disney Pictures?" I made a picture for Columbia called "Under the Yum-Yum Tree," and I was told that Walt Disney had ordered a print of that to run in his projection room. I think maybe that was it, or, one day at lunch Walt told me that "Ensign O'Toole" on NBC, that I had some great endings on that show. I thought to myself, "What a funny thing...to say it had great endings," but his show, "The Wonderful World of Disney," followed "Ensign O'Toole" on Sunday nights on NBC. So I thought maybe he was warming up his television set and watching the end of my show before his show, "The Wonderful World of Disney," so that might have been another way I got involved. DEAN JONES - Your question about high-speed driving and stunts ... As I say, sometimes I was doing stunts and didn't know it! Once in "(Herbie Goes to) Monte Carlo," there was this large piazza in Paris, and we were coming across the Piazza. I believe it was as we were going to the race start. It was before the race and the gun, and I was on the intercom and everything, and they said "Go!" ... So I took off across this piazza. It's full of traffic ... cars ... there were cars coming from every direction. I thought they were stunt drivers. So I just barreled through! I'm whipping because I thought all these guys were pros, and we all knew what we were doing. I got to the other side, and when I stopped, said to the director, "Hey! Some of those guys were really coming too close for comfort -- they were inches away at one point!" And I said, "Some of those stunt drivers were really coming dangerously close," and the director said, "They weren't stunt drivers. This is just regular Parisian traffic!" I was shocked because I had taken chances that I would never have taken had I known we were dealing with the Parisian citizenry! DAVID EVANS: Is that on film? DEAN JONES: Yes, on "Herbie Goes to Monte Carlo" when I cross that big piazza. Anyway, mishaps on either film? ...Mishaps? Well, we had flown 12 racing cars to Paris for "Herbie Goes to Monte Carlo," and they had been insured for a premium of $3,000. This sounds incredible, but there was insurance on these cars. If I recall correctly, it was only a $3,000 premium for the first month or the first two weeks, I'm not sure... At any rate, the first day we destroyed a $25,000 Porsche ... I can't remember but it was an expensive car ... so the insurance company was out a lot of money right on our first day! DAVID EVANS: Any mishaps with Herbie? DAVID EVANS: I saw you on TV the other day. DAVID EVANS: You were driving the new one. What do you think of the New Beetle? DEAN JONES: I like it. I like it a lot. DEAN JONES: The two-litre engine is real strong. Its gear box is good. They had racing Goodyears on the car, and it really hung well in the turns. DAVID EVANS: Was there one Herbie co-star in particular you enjoyed working with the most? DAVID EVANS: Well, actually I meant the actor. DEAN JONES: Well let's see. There was... I'm not sure of the list now. I mean, I enjoyed both of those films and even the television series. Number 10, (reading) Can you imagine the Love Bug would become such a big hit? No. No, we had no idea. Absolutely none. Of course, Walt bought the book before he died. The book's name was "Boy, Girl, Car," and the way they normally in those days would pick a title at Disney would be to get all the employees at the studio to suggest a title, and they'd write down the top 12 for the first preview. Then they would let a preview audience somewhere in L.A. or someplace check the title they liked best. And 98 percent of then liked "The Love Bug." So the movie was no longer called "Boy, Girl, Car," it was "The Love Bug" from then on. And we had no idea it was going to bring in $58 million the first couple of months, which was an enormous amount then. It rated right under "Gone With the Wind" in the top 10 motion pictures of all time for several years before the ticket prices went up and big blockbuster films like "ET" and others came in. Of course, it knocked "The Love Bug" way down on the list. But nobody had any idea. And I think if Walt had lived to see the release of the picture, he would not have believed it either. Eleven, (reading) What do you consider the main reason why Herbie was and is so popular? Well, you know, I think it's part of the benignness of the little car. He's so ... He's so innocent. It's such an innocent looking car, the VW. It was not a luxurious thing. It was not a hip thing. It was not a chic thing to drive a VW bug. They were cars that were just basic transportation. And you know, the Corvettes and the Porsches and the Ferrari and practically any other car could blow them off. But here was this little bug with more heart than the big cars, and it was the underdog that became triumphant. That was the basic appeal of Herbie. Twelve, (reading) Did Disney offer you starring roles in the other two Disney films, "Herbie Rides Again" and "Herbie Goes Bananas"? No, they didn't offer me those roles, and I think it was because I said that I didn't think the scripts were up to the quality of the first one. 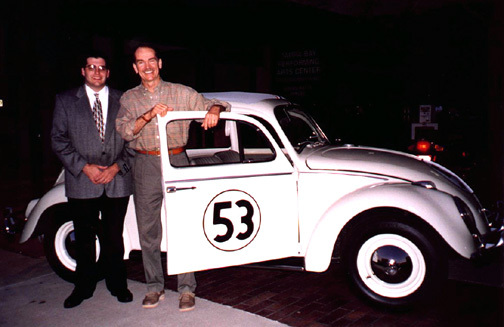 DEAN JONES: (Reading) Were you concerned with being typecast as Herbie's owner? No. I mean, everybody gets typecast in my business in one way or another. (Reading) Are you often recognized when you go out in public? Sure, all the time. (Reading) Has anyone ever called you Jim Douglas? No, but I have had people say, "Oh, you're Herbie's driver." And I would say, "Oh, that's right," but I had made 45 movies, and only two of them were with Herbie, but a lot of people remember me from other films. DAVID EVANS: That's such an impact on a generation, you know? DEAN JONES: Yeah. (Reading) Share your insight with us about Herbie tricks, wheelies, etc. What was real and what was special effects? With the first one (movie), there were no special effects. I mean we didn't have the computer-generated stuff. If it was done, it was done for real. For instance, three seconds of the film took six weeks to make. Well I guess maybe three or four seconds ... (the scene) where Herbie skips across the lake. They built two towers and they put a steel cable between them, and they started sliding a full size Volkswagen down these cables, and they set up the towers so they could rock them back and forth. Tighten the cable, loosen the cable, tighten the cable, loosen the cable. Then they built a lake in between the two towers, and they experimented with letting the towers go towards one another and the cable getting loose and dropping the car down to the water. Then they tightened the towers, the cable would tighten and the car would come up. So that's the way they got the look that it was skipping across the water. DAVID EVANS: Was that a real bug? DEAN JONES: That was a real bug ... they didn't have the engine ... I mean they lightened it up as much as they could, but it was a real body. DAVID EVANS: Yeah, I was just always curious about that. I'm glad you brought it up. DEAN JONES: My remembrance was that it was an actual ... they didn't have all the guts in there because it would have been too heavy ... but it was an actual body. ... The first wheelie in "The Love Bug" was done with a cable and a crane. When Herbie does his first wheelie, there was a steel cable attached to the front of the car that pulled it up. It was done mechanically because there were no special effects. Later ones, we lightened the front end, put more weight in back and we had the big engine in back. I could pop a wheelie real easy but that was not in the original "Love Bug." (Reading) When did Disney give you the Herbie? Oh about four, five years ago. They had one left from the original film. DAVID EVANS: That wasn't by chance the one in MGM Studios? DEAN JONES: I don't know if this one was that one, but I know this car, for a time, was the parade car at Disneyland in California. I gave it to my friend who owns a Porsche-Volkswagen dealership. (Reading) Do you own any Herbie memorabilia? No, I have given them all away for auctions. Like the watches I wore, wrist stopwatches, and those kinds of things. People from charities ask to auction things off. I have given them all away. I don't have any more. (Reading) Do you have any ideas of storylines? Oh sure, Every week or two I think of some storyline for Herbie. (Reading) Did it bother you that Disney changed the storyline about how Herbie came to be? In the (ABC) TV movie? DAVID EVANS: Me too. (laughs) That was one of the biggest reasons for watching. DEAN JONES: Well, thank you. I appreciate that, David. (Reading) How long will you be starring in this production of "Showboat"? We go to Fort Lauderdale and then to Kennedy Center in Washington, D.C. I will play two months in Kennedy Center. That will take until the end of July, and then I'll leave the show. DAVID EVANS: I hear a guy who races cars is planning on buying a New Beetle and putting Herbie numbers on it. DEAN JONES: Is that right? Oh, that's great. DAVID EVANS: A next generation Herbie, right? Greg Carr, the guy who was with me the night the two of us met you, he's a big fan of yours and he wants to know if there's an address we could write you? DEAN JONES: Well, I still get a packet every week from Disney to my office in California. Just send it to Walt Disney Studios in Burbank, California and it will get to me. DAVID EVANS: They are handling fan mail and all that? DEAN JONES: Oh yeah. Yeah, sure. They handle everything. DAVID EVANS: One of the other guys I know is from Arizona, and he actually went out to Disney's archives and researched the car, and his is really fabulous. His car is more correct than my car is. He's fanatical. His favorite movie is "Monte Carlo," so he is a big fan of yours too. DAVID EVANS: Would you be interested in seeing pictures of any of the Herbie cars from people in the club? DEAN JONES: Oh, sure. I would love to see some of that. DAVID EVANS: Do you have a computer at home? DEAN JONES: No, I don't use a computer, but my secretary and wife does. I'm not into computers. ... I would like to see you sometime David. I appreciate your interest. DAVID EVANS: Well, I appreciate you taking the time. It means a lot to me and everyone else. DEAN JONES: Well, God bless you my friend, and again, thanks for bringing your car down. I enjoyed seeing it. DAVID EVANS: You are very welcome. Thank you for taking the time to read my interview with Dean Jones. Hopefully, Dean will grant me another interview in the near future. To get back to my main page just click the HERBIEMANIA logo below.